It's day two of camp and I'm having a blast! The place we're staying at is so nice and so spacious. And the lighting is terrific! I escaped for a little bit and went shopping and decided to come to Panera to get online. I found a great spot - a big comfy chair in the corner. It has a cup holder and little table to put your laptop on. I could live here. :) I took several pictures and I'm in the process of putting them online. I did finish "Heart of America" yesterday, so I was very excited about that! 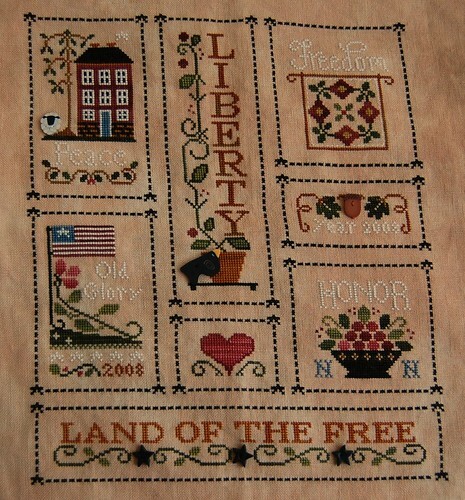 Little House Needleworks "Heart of America"
I started "Home of a Needleworker (Too)" yesterday after finishing HOA and I'm loving it. It's such a fun design! There are alot of lovely pieces! Sounds like you're having a lot of fun Nicole! HOA looks wonderful, congratulations on your finish! Great finish on HOA. Looks like a lot of fun this weekend! Your finish is great! It sounds like you're having a blast! Congrats on your lovely finish. Have a good time...even though it sounds like you already are, LOL! Lucky you, looks like an inviting retreat and Hearts looks wonderful! You have almost as many goodies there as at my LNS. Can't wait to see any new stash you acquire. Lovely photos - thanks for sharing. It looks like a great weekend. And photos of inside Golden Needle too. Do you see the Christmas ornament hanging between the two downstairs room - that's one of mine! I'm glad you're having such a great time! Heart of America looks wonderful - 'grats on your HD! HOA looks fantastic Nicole! You've done a great job. Your stitching weekend sounds like fun. I bet you went wild in the thread room? :) Great pics too! Did you pick up any stash, or is that a silly question? I'm glad you're enjoying Home Of A Needleworker (Too), will look forward to the progress pics. Wow Congratulations what a wonderful finish. So glad you are enjoying your stitch-away camp, what a lovely idea. Your finished piece looks great! Each design is wonderful. Thanks, too, for sharing your pictures. The camp looks like fun! Awesome finish, Nicole! Enjoy the rest of your stay!! Good lighting?! Wow, whenever I go anywhere away from home, the lighting is SUCH an issue!! Congratulations! on the beautiful finish. I justlove this design and is the first one i've seen done. Heart of America looks terrific ! What fun!!! HoA is gorgeous! WOW! Congrats on the finish! glad to hear you had fun ! and congrats on the finish it is beautiful! Your photos look like camp was a blast! Congrats on your beautiful finish too!